Some lettering trials by Tim Holloway, and a screenshot from tests to establish the dimensions for the deepest combinations in the Bold weight. The new Creative Suite 6 will ship with a Devanagari typeface in two weights, designed collaboratively by Tim Holloway, Fiona Ross and John Hudson. The new typeface, first released in 2011, had to be legible in both screen and print in text-intensive documents, while addressing the challenges of the heavier weight and offering a distinctive, modern interpretation of the script. The typeface takes a new approach to a traditional script, achieving a dynamic, fluid style with open counters, delicately flaring strokes, and a rounded treatment of distinguishing elements. This design approach is intended to counter the effect of repetitive verticals and horizontals prevalent in earlier typefaces. OpenType features and a character set of around 800 characters are employed to achieve a more sophisticated typographic texture, utilising alternative contextual forms, and regional variants. More details and images on the Adobe Typblography blog. 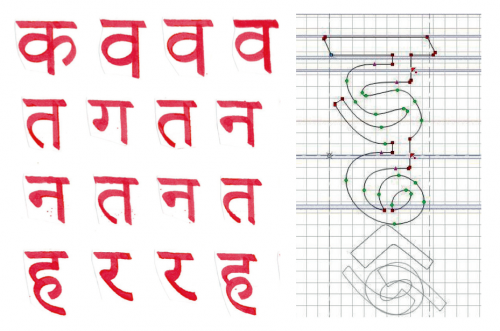 This entry was posted in research projects and tagged Devanagari, typeface design. Bookmark the permalink.